Verizon Wireless launched a new prepaid plan today. It includes 500 minutes of voice calling, unlimited text and picture messaging and unlimited mobile web for $35/month. While $35 a month for 500 minutes plus unlimited web and messaging sounds like a great deal, the catch is that the plan is only available with what Verizon calls a "Basic" phone. There are four such phones to choose from; the $49.99 Samsung Gusto 2 flip phone, $49.99 LG Cosmo 2 QWERTY slider, $59.99 Samsung Intensity III QWERTY slider and the $69.99 LG Extravert touchscreen QWERTY slider. None of supported phones are smartphones and none have 3G support. The inclusion of unlimited web is not a big deal as it's hard to use very much data with such simple devices. The Gusto 2 and Cosmo 2 have WAP browsers that can't handle many modern websites. If you want to use the web on this plan go with the Intensity III or Extravert which come with the much more capable Opera Mini browser. The new plan fills a gap in Verizon's prepaid lineup shown in the table below. It's a good choice for the typical feature phone users who texts a lot, talks a bit and wants to occasionally look things up on the web. 1 An $20 overage bundle of 1 GB of data, good for 30 days is also available with the $70 plan only. Not for me. I love the price, but I am not giving up the smartphone. No 3G??? When they make the plan $25/month, then we are talking! Wow, you take cheapness to a whole new level. No doubt! The prepaid 1X is not as slow as you think. And the phones have any website that you would ever need. No Cheapness, just reality........ Remember no 3G and no smartphone support. Being that VZW pockets are deeper than the Marianas Trench in the Pacific Ocean, for that price-point 750 talk minutes would have been great. It's a bad deal at $35 a month once they eliminated the unlimited Verizon to Verizon feature. Who talks more than 500 minutes anymore? If you job hunting or talking to friends and family, 500 mimutes a month is nothing. It doesn't cost Verizon that much to offer unlimited Verizon to Verizon as a service. Your call is not leaving Verizon's network. I would easily pay $35 for 500 minutes, unlimited texts, and unlimited HTML browsing AND the unlimited V to V.
It's 500 anytime minutes but also according to Verizon prepaid CS and at least one online news source, they are going to be allowing you to activate other Verizon prepaid and clean esn postpaid feature/basic phones. NO touchscreens except the pokey 1xrtt Extravert. Still , a better deal then anyone would have imagined. Funny how Verizon's prepaid keeps evolving while rival Att's is stagnating. Mobile to mobile is nice but in this day and age where unlimited anytime minutes is king, it's an endangered species. Unlimited Verizon to Verizon is the only reason why I haven't left Verizon prepaid. I pay $100 a year for service and talk mostly on holidays and friends and relatives birthdays. Most of my friends and family are on the East Coast and they have Verizon. I just looked at my balance and I have over $200. The good news is the money can be applied towards a new Verizon phone on contract. 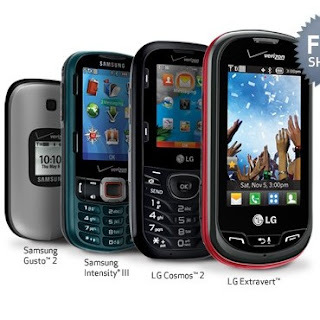 Btw, Verizon just releases two new basic phones by LG. Since I want a 2.0 MP camera/camcorder and mini opera HTML broswer with decent screen size, it majes the Samsung Intensity III the best pick. However, I refuse to buy Samsung products since they steal IP. The minimum monthly cost is $8.33 based on $100 top up card. I have the $0.99 plan and each year, I buy the $100 card and I don't need to worry about buying any more top up cards unless I run out of money. It's great as a backup phone and using the unlimited Verizon to Verizon for $1 a day.